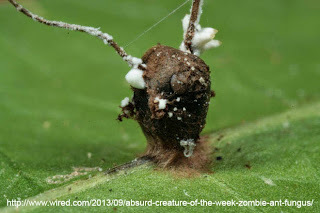 One of my favorite and one of the most popular blog posts is the Ophiocordyceps post, the fungus which zombifies ants in order to spread. What I didn't know when I wrote that post was that the story doesn't end there. 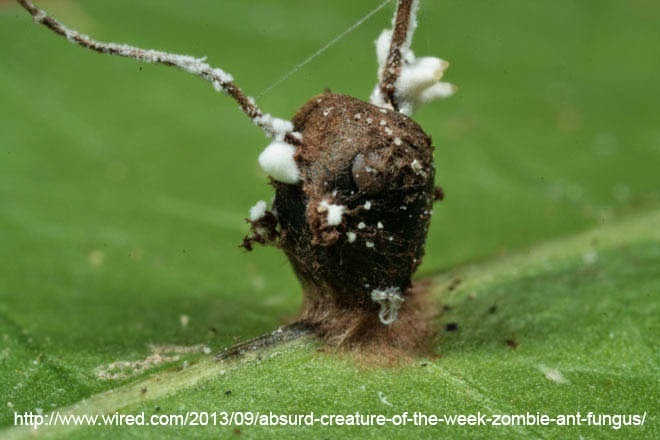 According to a 2012 article Ophiocordyceps is not only a specialized parasite but also the host to another specialized fungal parasite. Once it reaches the stage when it starts producing a stalk to spread its spores another fungus grows over the top of it and sterilizes the Ophiocordyceps. It then begins to produce its own spores. 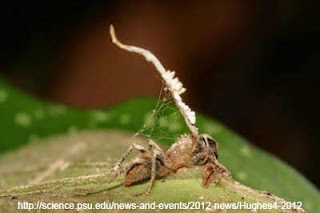 This mysterious hyperparasite is yet to be identified and there is probably more than one. They probably exist wherever you find Ophiocordyceps, but it is all highly speculative at the moment.